Once established, bed bugs will spread out toward the perimeter of the room, including walls, moldings, and rugs. They will also burrow between cracks, edges and crevices. To cover all your bases and ensure that a thorough investigation of the area has been completed, follow the steps below. Although the bed is the most common place for bed bugs to infest, other areas are equally susceptible to them. 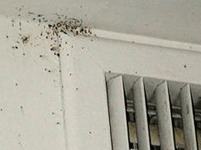 Our next blog will cover some of the more unusual locations we have found and treated bed bugs.